The short pieces in “Show Her” have been likened to mosaics, so what was it like to assemble a collection of very short works? In many ways assembling the collection was a great deal like creating a mosaic, a momentous creative act of its own, placing together pieces to make a shapely whole, while allowing each piece to shine its own light. At first, I had little idea about how to arrange all of the pieces. A few seemed to suggest easily enough their placement beside one another, either to complement or to correspond with or to juxtapose one another, and also, together, to affix significant waypoints. However, since a text is linear, even these pieces needed to set before or after one another. Making such decisions meant keeping in mind—and more often, discovering—larger themes and possibilities. Moving pieces around to try them here or there offered up an expanse of promises. Immersed in solving the artistic problem, I experienced the same sense of wandering lost in the forest that I do sometimes when in the middle of writing. The angst can be intense. Eventually, the right pattern seemed to emerge and take on its own life, and I experienced that sense of wonder—and relief—that accompanies the inexplicable knowing of the creation’s “rightness,” with its sense of inevitability. The creative process was exhilarating, worrying, daunting, intriguing, and all-encompassing. When it was finished, it seemed it couldn’t be arranged any differently. How does your work as an editor affect your writing? In many ways, but I’ll keep it to a few. First, it’s thrilling to bring to the world writing that moves me. On a fundamental level, I feel about the two inaugural titles WTAW Press will publish this September much like I did when I bought my first present for my dad (a tiny notebook with an accompanying small pencil, barrel painted gold)—hardly able to contain myself in the buildup to the holiday when he would open his perfectly chosen gift. Similarly, the titles are brilliant gifts I can’t wait for the world to receive. .
Secondly, editing the work of others, seeing how to deepen or enliven a text, helps me in editing my own work. I’ve become sharper, more agile, perhaps, at this art. My first drafts sometimes arrive with a concision nearer to the acuity that I’ll work to achieve through multiple revisions. So, twenty revisions rather than thirty, maybe. Lastly, reading through scads of profoundly affecting submissions assures me of how fathomless the creative well is. How can that not be an inspiration? It keeps hope alive. Of course, though lately I’ve been thinking (again) about the nature of “bad” habits: it seems that such habits serve valuable purposes and as such, perhaps, can’t really be termed “bad.” For instance, I have a habit of questioning assertions. I internally argue for the opposite of what someone states, even benignly as a matter of conversation. This seemingly reflexive behavior—examining even what I myself say—however can and does often lead to written work that, I’ve been told (is it true? ), is imbued with mystery and power. Over more months than I care to name, I’ve been painting my toenails the same shade of pale green with glitter, for seemingly no good reason. However, it may be that with this habit I’m simply accomplishing something else of significance, perhaps something to do with pleasure, since the face of a friend floats to the forefront of my awareness each time that I apply the sparkly green polish. This friend once complimented me on the nail polish, a friend I don’t see very often, except in my mind when I use the green polish. Are there questions you are unwilling to answer? Perhaps. I’m not fond of the usual interrogative: how much is your fiction based on your life? That said: Not at all and completely. Perhaps if I allow myself to use it regularly, other characteristics of Alice Munro’s genius—the queen of the word’s masterful use—will osmose into my writing. PEG ALFORD PURSELL is the author of Show Her a Flower, A Bird, A Shadow (ELJ Editions, March 2017), a collection of hybrid prose and micro-fictions with praise from Peter Orner, Joan Silber, Margot Livesey, and others. Her stories and poems have appeared in Permafrost, the Los Angeles Review, Forklift Ohio, Joyland Magazine, 100 Word Story, and many other journals and anthologies. 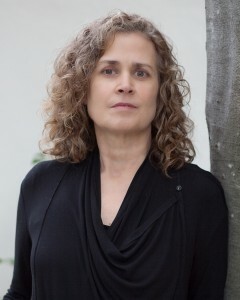 She is the founder and director of the national reading series Why There Are Words and founder and director of WTAW Press. She lives in Northern California.